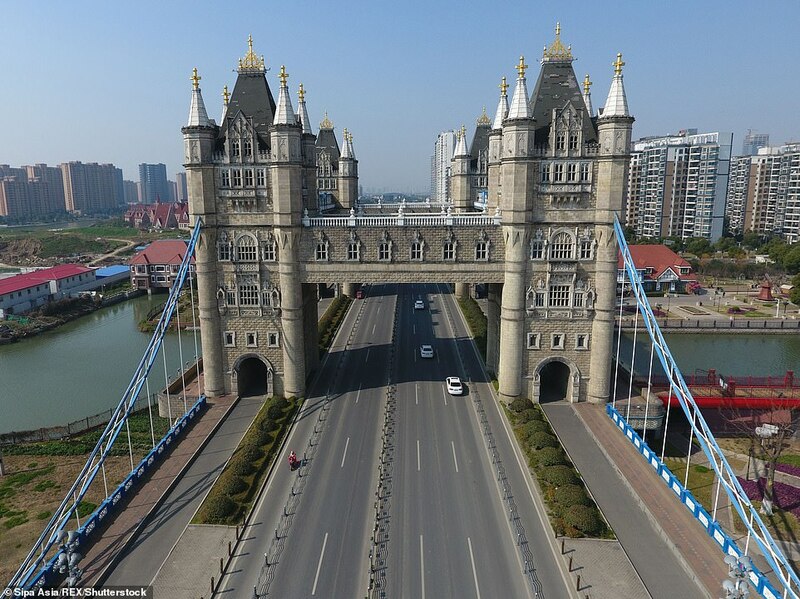 A copy of London’s iconic Tower Bridge in east China has drawn ridicule after it was left unrecognisable from an expensive makeover. 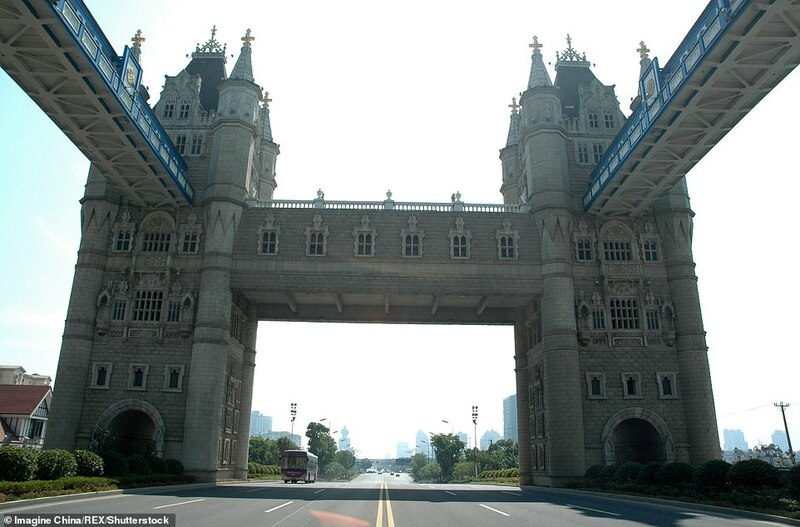 The Tower Bridge replica, which is double the size of the British version with four turrets, was built in the tourist city of Suzhou, Jiangsu province in 2012. 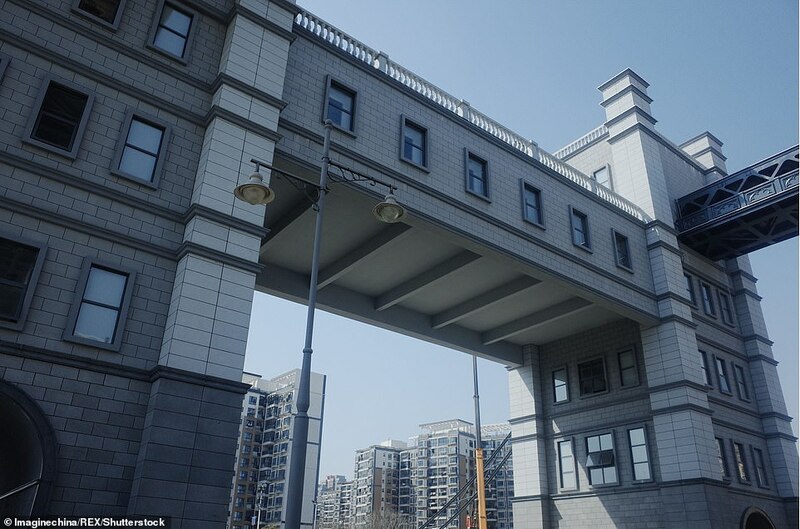 Government officials last September invested 20 million yuan (£2.2 million) in renovation works to ‘make it more Chinese’ and ‘more coherent with the surrounding architectural style’, Chinese media reported. 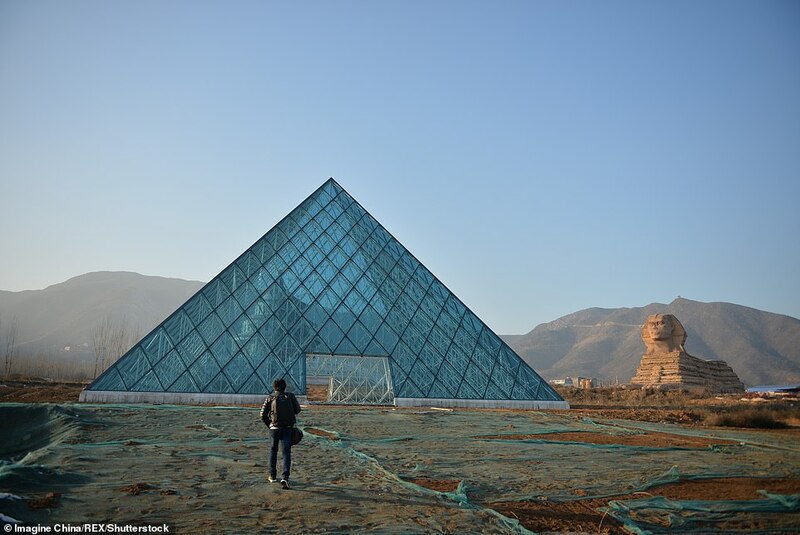 The renovated landmark was recently unveiled following six months of construction, according to Beijing News. 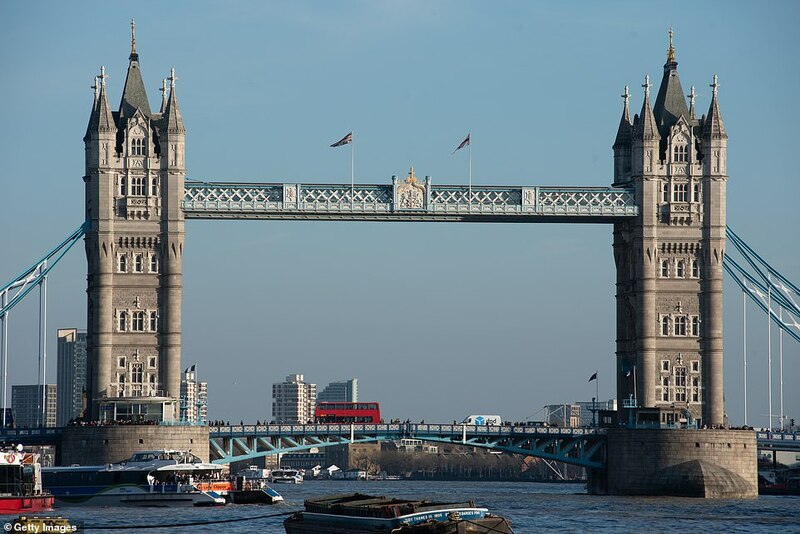 Photos and video footage released on Saturday show the entire structure painted over with grey paint, its distinctive pointed turrets mowed flat and its ornate mullions replaced with rectangular panes – much to the horror of surrounding residents and net users. The structure, which has been a hit location for ‘European-style’ wedding photography, now looks like a prison, net users said in protest. Some users even said it looks like a military Pillbox – a concrete guard post dating back to World War Two. ‘Who decided to remove the pointed turrets? 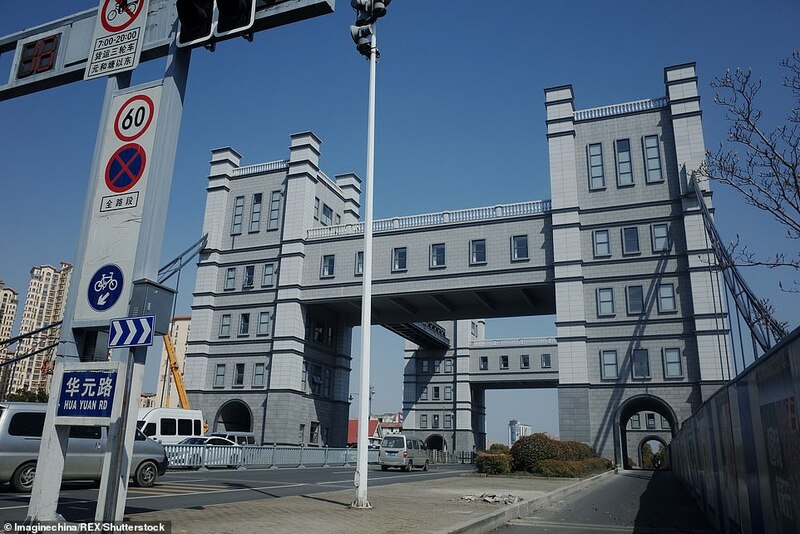 It’s so ugly I can’t look at it,’ one user commented on Chinese microblogging site Weibo. ‘To be honest, it looked quite magnificent before as it was a pretty good replica, now it just looks ridiculous,’ another person said. 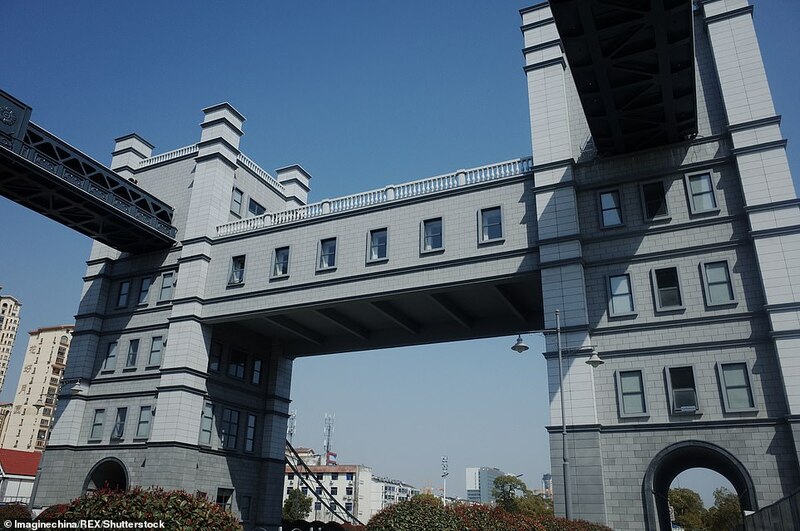 The bridge, located above the river Yuanhetang, is 45.9 meters (150 feet) wide and includes fast and slow lanes and a pedestrian pavement. Each of the five-storey towers is 40 meters (131 feet) tall and are connected by a pair of suspended walkways. There are also elevators taking visitors to the top for a bird’s-eye view of the city. 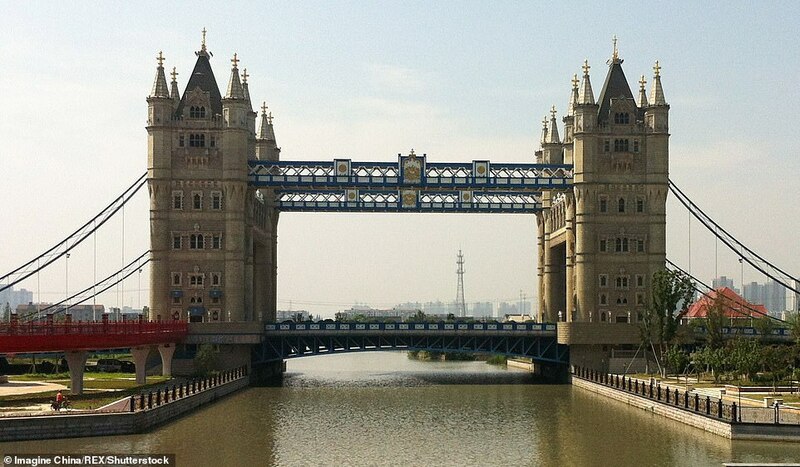 Unlike the real span in the UK capital, which was opened in 1894, Suzhou’s model is not cantilevered and cannot open to let tall boats pass. 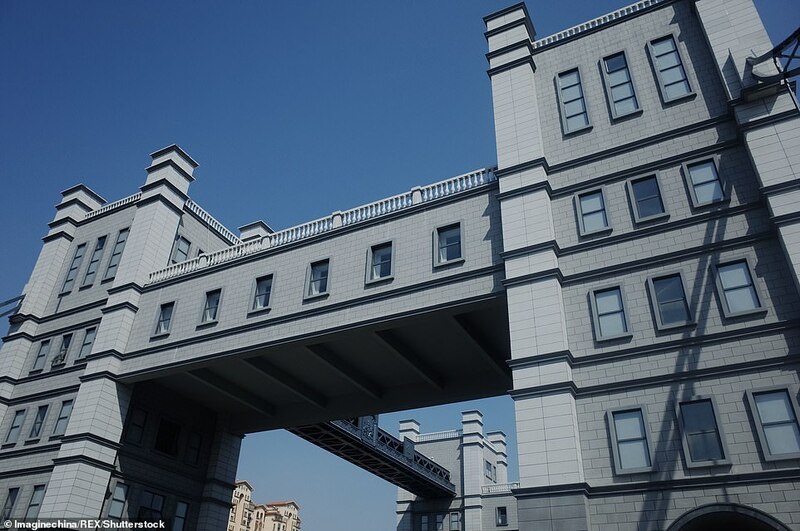 An official of the Xiangcheng district government told Beijing News in late January that the renovations are necessary to repair wear-and-tear damage following years of traffic. ‘Considering the area’s future urban development, we also re-designed the structure to make it more coherent with the overall surrounding architectural style,’ the official added. 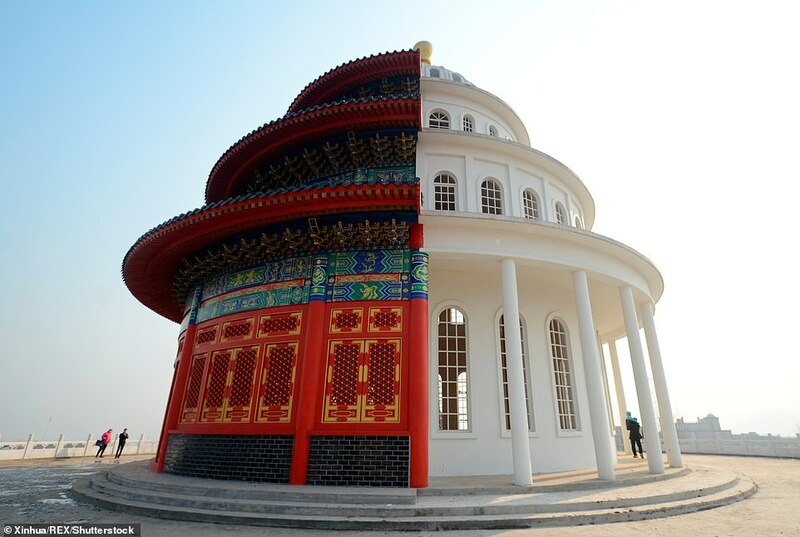 Sitting about 200 miles north-west of Shanghai, Suzhou has become well known for cloning other world-famous landmarks. 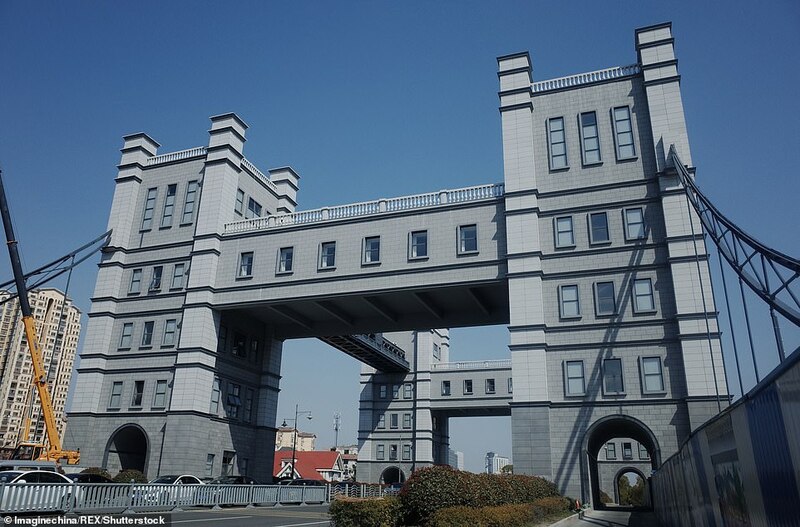 In 2008, the Suzhou government announced they would build the copies of 56 landmark bridges from around the world on its rivers. So far, the city has its own Sydney Harbour Bridge, as well as a copy-cat Pont Alexandre III bridge straight out of Paris, the French capital. On top of that, the area boasts a Dutch town complete with windmill and Dutch-style housing. The city with 6.6 million residents is often dubbed the ‘Venice of the East’ and has been an important hub of China’s silk industry for around a thousand years. 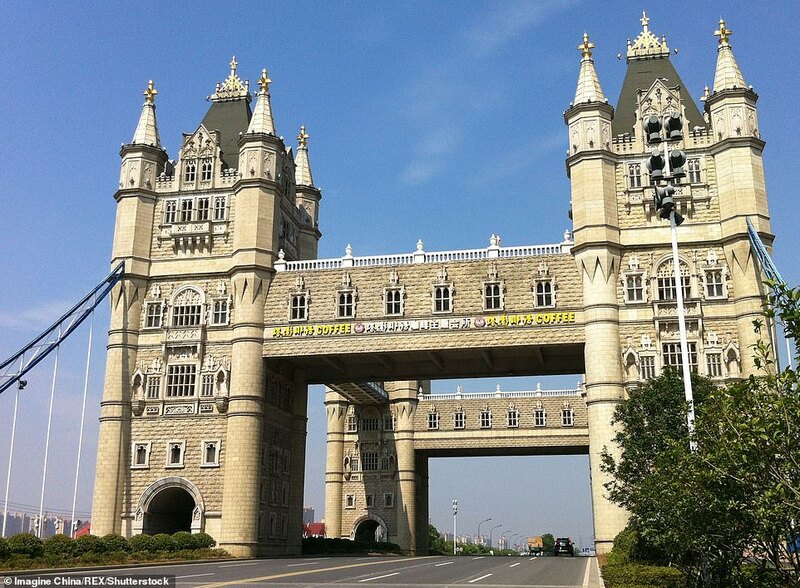 Elsewhere in China, replicas of world-famous landmarks can be found, including a Thames Town near Shanghai, a replica of Austria’s Hallstatt resort in Luoyang, Henan and copycats of the Eiffel Tower and the Champs Elysee square in Hangzhou. 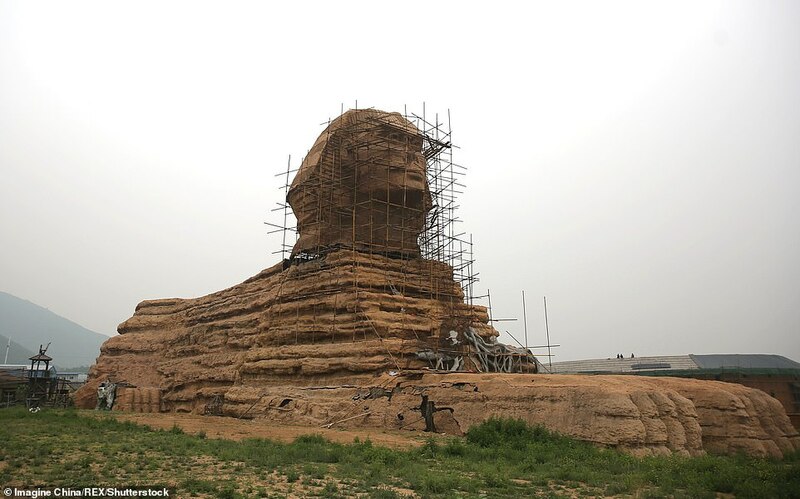 Last June, a full-size replica of the Great Sphinx of Giza has reappeared in a theme park in Shijiazhuang, Hebei province, reigniting fury from the Egypt government. The Sphinx copy measures almost the same size as the original, with its appearance resembling closely to the world-famous limestone statue currently standing on the Giza Plateau on the west bank of the Nile. The model belongs to Hebei Great Wall Film Studios. 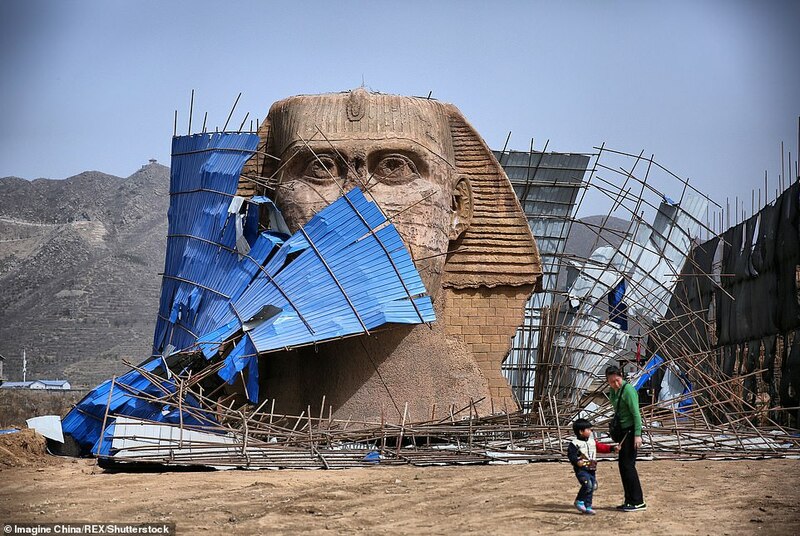 Chinese media previously reported that the statue had been built as a film set in the theme park. But it unlike the original – which was carved from limestone – the Chinese version appears to have been built using reinforced concrete.